The hunt for the seven shards of the Shattered Star leads the heroes back to the western coast of Varisia, to the multifaith monastery known as Windsong Abbey. The next shard appears to be hidden somewhere within the dungeons below the abbey. But when the PCs arrive, they find the monastery in ruins and held by savage giants and twisted fey! An ancient terror has returned home, and now dwells within the levels beneath the monastery - a terror who hopes to open the dread within! 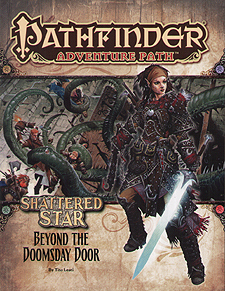 "Beyond the Doomsday Door," a Pathfinder RPG adventure for 10th-level characters, by Tito Leati. Delve into the horrors of the Abyssal monstrosities known as qlippoth, by James Jacobs. Learn about the faith of Groetus, God of the End Times, and the madness of his tortured clergy, by Sean K Reynolds. The perils of being a junkie in Riddleport in the Pathfinder's Journal, by Bill Ward. Five new monsters, by James Jacobs, Sean K Reynolds, F Wesley Schneider, and Jerome Virnich.